The Skinny: An odd little comedy about death and the people who have to deal with it. At times funny and touching, Happy Funeral Director is like an imperfect but interesting treat for anyone tired of standard Hostess-brand comedy. by RainDog: After a close brush with death, Cheol Ku (Kim Chang-Wan) decides to try his hand at working at the funeral parlor of a small town. He's joined in his new job by two others. Jaehyon (Lim Chang-Jung) has reluctantly joined his grandfather (the happy director) in the funeral business after racking up debts in Seoul, where he'd like to go back to open a video arcade. 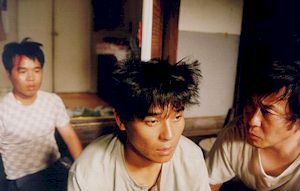 Daesik (Jeong Eun-Pyo) is a young townsperson who's working for the grandfather almost by default, because he has nothing better to do. The three of them are social misfits, and working at the funeral parlor is an uncertain prospect at best, both because of the slow business and because of their natures and desires. At its heart, Happy Funeral Director is an art-house comedy, like an early Jim Jarmusch film only with more editing. The story ultimately takes a backseat to the interactions of the three would-be funeral parlor workers, who don't seem to have a lot in common. They hang out at various locations around the town and have conversations of no importance, but whichare frequently amusing, wry and charming. If they're not sitting with nothing to do in front of the local grocery or some other place in town, they're at the funeral parlor watching violent Hong Kong movies and wondering why Korea couldn't ease up just a little on its strict gun laws, so as to finally provide them some clients. A lot of the humor comes from the dark comedy of hoping for business, trying to learn the trade (usually practicing on each other), and trying to deal with their sexual frustrations. The best humor, though, comes from the main characters themselves as they kill time. There's a charming familiarity about the scenes when the characters aren't really doing anything at all. Other familiar humorous moments are quieter than we might expect from modern comedies, such as when Jaehyon has to race a rival funeral parlor to the scene of a death (yes, they eventually get to deal with some corpses) to hang his business' lantern to secure the job. There's nothing laugh-out-loud funny about the scene, but it's done with such good nature that it's hard not to grin through the whole thing. Most of these bits are nothing more than just bits, and may or may not have anything to do with the story as a whole. This is not situational comedy that we're familiar with. Events do not go from point A to B to be resolved at C. As a matter of fact, there are a few plotlines that are never resolved, characters who disappear from the story, and even scenes we'd expect to see (such as the circumstances around a few deaths) that are missing completely. Many people aren't going to be comfortable with the lack of disclosure, and may chalk it up to lazy writing. Personally, I found this aspect of the film to be refreshing and felt it went a long way towards bringing the characters closer to the real world, which isn't always as exciting or as logical as we would hoped. And while a movie that accurately portrays boredom would seem, well, boring, there's a lot here to keep us going, including a pair of romantic interests, four funerals, a questionable business plan, and a very odd gang rumble at a children's event. The movie also has its share of tragedy, as two of the funerals are for people they care about. An odd element of the film that should be mentioned is that the comedic realism frequently turns to magical realism where the dead are concerned. For example, there's a small, well-filmed story at the beginning of the movie about how the grandfather met his wife, and the recurring roles of the rather expressive corpses they have to deal with. This works in the film's favor when it's used for comedy, but tends to work against the film's stronger elements when it's used for the sake of playing with the viewer's other emotions. The penultimate scene, for instance, is highlighted by a magical rain that doesn't pack much punch, mainly because it's both unsurprising and forced, cheapens an otherwise sad event, and seems as out-of-place in this movie as the typical studio executive's editing decision. What becomes clear is that this film is obliquely about the difficulties of coping with lonelinessa loneliness only mitigated by the strange bond of the three main characters and the grandfather, and by the funeral business itself. None of the characters are married, two of the them unsuccessfully deal with trying to start relationships, and others have had to deal with the deaths of loved ones in their pasts. More tellingly, the people who they perform funerals for all die to one degree or another as a result of being lonely, from literally killing themselves out of loneliness to dying while visiting the grave of a loved one. It's only subtext, however, and the viewer can take from it what he or she wants. Kim Chang-Wan, a composer turned actor, puts in a strong performance as does first-timer Oh Hyun-Kyung as the grandfather. It's interesting to note that all the actorsand there's not a bad one in the bunchare all newcomers (or relative newcomers) both young and old. It is also director Chang Mun-Il's first film, which shows a bit in both the writing and directing, but as such it's pretty amazing, too.